We are considering the possibility of publishing interviews with Roy in the future. 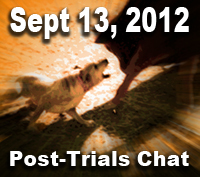 This is a quick test of the concept as we discuss the recent cattle dog trials in Wichita Falls, Texas, on September 13, 2012. The interview can be found under the MEDIA main menu tab on the AUDIO INTERVIEWS page. If you haven’t clicked around recently, notice that we continue to make little adjustments and additions to the website all in the name of improvement. We appreciate your comments and ideas. If you are interested in just attending and watching, CLICK HERE to learn more about the Red River Cattle Dog Trials competition scheduled for Thursday. Roy Cox is scheduled to compete with two dogs in the Pro Novice class and two dogs on the Nursery class. Directions to Birdwell Ag Center. Off of 287: Exit 1A. Left on 6th street. 2 Blocks left on Burnett Street. If you need RV hookups reservations are taken at Kay Yeager Coliseum Box office. Yet to see a more effective stockman! “I have known Roy for approximately 18 years. I have been to his clinics and also have used him to train some of my dogs. Spud is the latest dog that I have that was trained by Roy. He is a pleasure to work and very fun to be around. Genius with a dog and a horse. Roy will be competing in a few of the trials on Thursday, September 13, 2012, in the Red River Cattledog Trial which is a Midsouth Regional Finals Qualifying Trial. Details are still pending.